ACCOUNTING INTERVIEW Q &ANSWER :Why did you select accounting as your profession? The First and most frequently asked question in accounting job interview. This question can be asked in many different ways. They might ask “Why accountancy?” “What factors led to you choose this career?” “Why did you choose this career?” or “Why did you want to go into this profession?” etc. If you are looking for accounting job, you need to give an answer to this question, and if you don't have an answer, means that you're not fully interested in this field. You should talk about the future goals, career goals, experience and skills as your principal motivation. Don’t just say you like it. Anyone can do that. Focus on your sucess stories, experience , ideas, and career goals. The interviewer wants to know how much planning and thought actually went into your career selection. The interviewer might throw some of the related question, so don't try to fake it, instead make some backup examples to prove them that you are strongly motivated. Remember, your response to this foremost question could make or break your job. - Don't say "I have studied accounting at the University, So i selected accounting as a major profession" OR "I have worked in this field for 3 years, so i selected this profession". - Your goal is to get to the next step, so you'll want to provide focused responses that showcase your skills, experience, and fit with the job and the employer. 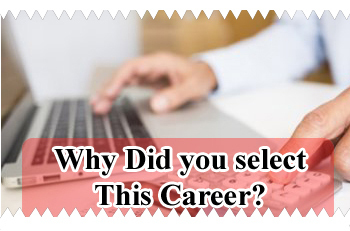 - Pick one of the main reason why you chose the career path and elaborate with a few specific points to backup your answer. You don’t have to go into a detail about each point, but make sure you are able to answer if you are asked. - The salary is an important factor to your interest in this job, but it should not be the overriding reason for your interest. - Your answer shouldn't just try to levitate yourself to at this job because it would make your life secure. Assure them that you are focused and have a genuine passion for your chosen industry. - Don't say "There are less responsibilities and no work Pressure." - Express how your skills would be able to hit the ground of sucess or takes you to the next level. - Make sure you can back up what you’ve said on the resume or in the job interview. - Making a reasons like money, status or that your parents made you do it, is a possible cause to loose your job. Sample Answer For Experienced or Freshers: Since my Childhood, I knew I wanted to do something like this. I always expect facing a complex problems occurred in unexpected situation and deal with difficult people to encounter a new challenge. I enjoy the analytical side of business and this career has given me insights into how a business really worked. This is the field where decision making activities are performed, matters concerning profits & losses are discussed. This career has made me able to identify several cost reducing strategies that helped minimize expenses, reduce equipment financing costs, and decrease the overall burden of the companies debt through restructuring. I believe this career allows me to grow exponentially as a professional and as a person. Apart from my career goal, My Bachelors/Masters/Professional degree in accountancy enforces my commitment towards this profession.